The UMN findings include hyperreflexia and spasticity. They result from degeneration of the lateral corticospinal tracts in the spinal cord. The LMN findings include weakness, atrophy, and fasciculations. They are a direct consequence of muscle denervation via destruction of the anterior horn cell. ALS is eventually fatal because of respiratory muscle weakness. Aspiration pneumonia and medical complications of immobility contribute to morbidity. Although ALS is incurable, there are treatments that can prolong meaningful quality of life; therefore, diagnosis is important to patients and families. Emergency physicians should be familiar with amyotrophic lateral sclerosis (ALS) and should consider the diagnosis in patients with only motor syndromes. The diagnosis of ALS is primarily clinical. Electrodiagnostic testing contributes to the diagnostic accuracy. ALS can be differentiated from stroke or trauma due to the subacute or chronic progression of symptoms. When focal limb weakness occurs, ALS is differentiated from a root or peripheral nerve lesion by the lack of pain or sensory symptoms. While ALS is a slowly progressive disease, a precipitous event may occur to bring the patient to the emergency department (ED). The patient's family first notices slurring of words or choking during a meal. An aspiration event or acute respiratory symptoms of air hunger occur. The patient notices wrist drop interfering with his or her work performance. Or, the patient may find reduced finger dexterity, cramping, stiffness, and weakness or wasting of intrinsic hand muscles. The patient may develop foot drop resulting in a fall or sprain. Fasciculations may present early on in the disease, particularly in the tongue. Patients initially are cared for symptomatically, and emotional support should be available to the patient and family. Discussion of a new diagnosis of ALS in the ED is inappropriate before further evaluation occurs. If a living will or a declaration for a natural death is in place, keep patients comfortable and do not intubate. Complications, such as infections, deep vein thrombosis, or respiratory insufficiency, should be managed appropriately. Refer patients to a neurologist experienced in the diagnosis and treatment of neuromuscular diseases. Refer to a pulmonologist if respiratory failure is imminent and patient wishes allow. Physical and occupational therapy and speech pathology consultations assist the patient with amyotrophic lateral sclerosis (ALS) in maintaining strength, daily living activities, and communication skills (as demonstrated in the image below). 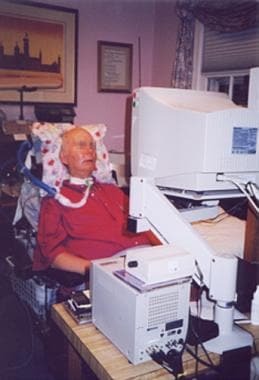 Patient with amyotrophic lateral sclerosis (ALS) using eye-gaze computer device to conduct business and communicate. When forced vital capacity (FVC) reaches about 50% of predicted levels, supplemental respiratory support may be needed. (The first symptom may be disturbed sleep.) Use of noninvasive positive pressure ventilation improves quality of life; further respiratory deterioration may necessitate tracheostomy and ventilator support. Patients with progressive weight loss, symptomatic dysphagia, or aspiration should be considered for percutaneous gastrostomy placement. Risk of percutaneous endoscopic gastrostomy (PEG) placement increases with declining respiratory function. PEG is best placed before FVC falls to less than 50% of predicted levels. Advance directives may be addressed by the patient's neurologist and be discussed at regular intervals. Hospice referral may be appropriate to aid in care during the terminal phase of the disease. Treatment of pneumonia  or urosepsis (both of which are complications of amyotrophic lateral sclerosis [ALS]) initially involves the empiric use of a relatively broad-spectrum antibiotic or antibiotics effective against probable pathogens, after appropriate cultures and specimens for laboratory evaluation have been obtained. These medications may include cephalosporins, fluoroquinolones, vancomycin, penicillins, and aminoglycosides. For patients who develop fatigue while taking riluzole, withholding the drug may be considered. Treatment of spasticity is not specific for amyotrophic lateral sclerosis (ALS). These can be used in patients with ALS who may have secondarily impaired neuromuscular junction transmission. Pseudobulbar affect, excessive laughing or crying or involuntary emotional expression, affects 20-50% of patients with ALS. combined dextromethorphan and quinidine has been administered for this condition  . This drug combination was approved by the FDA in October 2010. Spataro R, Lo Re M, Piccoli T, Piccoli F, La Bella V. Causes and place of death in Italian patients with amyotrophic lateral sclerosis. Acta Neurol Scand. 2010 Sep. 122(3):217-23. [Medline]. [Guideline] Andersen PM, Borasio GD, Dengler R, Hardiman O, Kollewe K, Leigh PN, et al. EFNS task force on management of amyotrophic lateral sclerosis: guidelines for diagnosing and clinical care of patients and relatives. Eur J Neurol. 2005 Dec. 12(12):921-38. [Medline]. [Full Text]. Deflorio C, Palma E, Conti L, Roseti C, Manteca A, Giacomelli E, et al. Riluzole blocks human muscle acetylcholine receptors. J Physiol. 2012 May 1. 590:2519-28. [Medline]. [Full Text]. Banfi P, Ticozzi N, Lax A, Guidugli GA, Nicolini A, Silani V. A review of options for treating sialorrhea in amyotrophic lateral sclerosis. Respir Care. 2015 Mar. 60 (3):446-54. [Medline]. [Guideline] Miller RG, Jackson CE, Kasarskis EJ, England JD, Forshew D, Johnston W, et al. Practice parameter update: The care of the patient with amyotrophic lateral sclerosis: drug, nutritional, and respiratory therapies (an evidence-based review): report of the Quality Standards Subcommittee of the American Academy of Neurology. Neurology. 2009 Oct 13. 73(15):1218-26. [Medline]. [Full Text]. [Guideline] Miller RG, Jackson CE, Kasarskis EJ, England JD, Forshew D, Johnston W, et al. Practice parameter update: The care of the patient with amyotrophic lateral sclerosis: multidisciplinary care, symptom management, and cognitive/behavioral impairment (an evidence-based review): report of the Quality Standards Subcommittee of the American Academy of Neurology. Neurology. 2009 Oct 13. 73(15):1227-33. [Medline]. [Full Text]. Anagnostou E, Rentzos M, Alexakis T, Zouvelou V, Zambelis T, Evdokimidis I. Volume matters: the influence of different botulinum toxin-A dilutions for sialorrhea in amyotrophic lateral sclerosis. Muscle Nerve. 2013 Feb. 47(2):276-8. [Medline]. Brooks BR, Crumpacker D, Fellus J, Kantor D, Kaye RE. PRISM: a novel research tool to assess the prevalence of pseudobulbar affect symptoms across neurological conditions. PLoS One. 2013 Aug 21. 8(8):e72232. [Medline]. [Full Text]. Pioro EP. Review of Dextromethorphan 20 mg/Quinidine 10 mg (NUEDEXTA(®)) for Pseudobulbar Affect. Neurol Ther. 2014 Jun. 3 (1):15-28. [Medline].